Getting Married at Riviera Maya. Jenna and Thomas are one of my favorite Canadian couples. They contacted me by email, as they were planning to celebrate their wedding in Riviera Maya. Their plan was for me to capture this very special moment for them and for their family and friends. Jenna was already an expert and knew what she wanted for that day. She is a wedding planner in Edmonton, so she knew how to plan her budget, find the best local vendors, and handle every detail with the less amount of stress. Here are some of the tactics that Jenna used to get everything she and Thomas wanted for this special day. They keep their budget under control. Always is important for every couple organizing their wedding, and particularly for those that are planning a destination wedding. The strategy of a wedding planner to organize her own wedding. There are options and various elements that you can use to your advantage to play a little with your wedding budget. Jenna and Thomas chose to have their wedding at an all-inclusive resort, as this was the best fit for what they wanted. 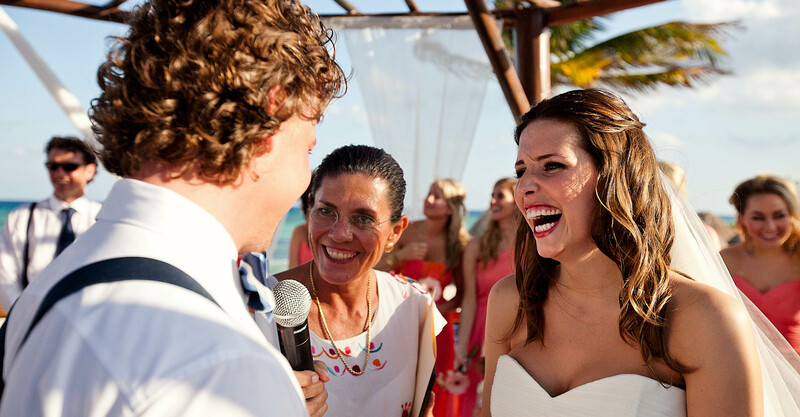 Their wedding took place at the Grand Sunset Princess Riviera Maya. Planning the wedding at a venue like this allowed them to organize the wedding together with the event organizer of the hotel. Jenna and Thomas profited from the infrastructure that the all-inclusive provided them, such as the beauty salon, the spa area, the restaurants and of course, the possibility to accommodate their guests in the hotel. Everyone was able to enjoy all the services from the hotel and enjoy their mini-vacations during the wedding weekend. This provided Jenna and Thomas with the best of both worlds: a top-notch wedding venue and the opportunity to give their guests access to different activities and services. During the wedding day, we start with the preparations of Jenna and her ladies. Usually the bride gets most of the attention during this time. The ceremony was held in the main palapa of the hotel which was located just in front of the beach, with astonishing views of the sea. After the ceremony, we did a family session and then the official photos of the bride and groom. I highly recommend you to dedicate some time to do a more formal session with your loved ones after the ceremony. Afterwards, we continued with the traditional toast and the speeches, followed by a wonderful party that these newlyweds were able to enjoy in the company of their family and friends.